Match.com has been around since 1995, which makes them one of the oldest online dating sites in existence. Since launching, Match.com has built up a great reputation and they possess a very large membership base with customers in many countries around the world. They are probably one of the best known dating sites in countries such as the United States and the United Kingdom, largely because of their extensive advertising campaigns in these regions. Unlike many other dating sites that we review, Match.com does not particularly focus on a specific group of people or those looking for a specific type of relationship. They can boast plenty of success stories from couples who have met and gone onto have a serious long term relationship and they also have lots of members who are looking for casual dates too. With a broad range of members, a trusted reputation and an easy to use website, Match.com is a dating site that should appeal to anyone. Like most of the best dating sites, Match.com has made it very simple to register and create your profile. The sign up process is straightforward enough; you will need to choose a username and password and provide some basic information about yourself. 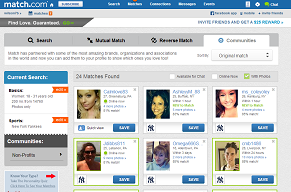 Creating your profile is also simple, and you can even pay an extra fee to use the Match.com Profile Pro service. This will give you the added benefit of having a professional writer look over your profile and make any necessary improvements to help make it stand out. Certain information is required when creating your profile but you can essentially write as much or as little as you want. It is always a good idea to spend some time creating as detailed a profile as possible, as this is ultimately all that other members have to judge you on. You are not obliged to upload any photos, but you really should if you want to give your profile the best chance of being noticed and attracting interest from other members. You can actually register and create your profile for free, although you will not be able to send and receive messages. f you have taken the free dating option you will be able to search for matches at Match.com, but you will need to be a paid member to take advantage of the complete functionality offered. The search function here is very sophisticated and yet still easy to use. You can do a quick search to find matches based on the information you provided at registration or you can customize a search to find matches with specific characteristics you are looking for. There is also the “Reverse Match” search which highlights other members who are looking for someone like you. The search facility is very good at returning accurate matches, and this is one of the reasons why Match.com has so many success stories and has grown to be such a popular dating site. With a range of different search functions and the ability to customize your searches however you want, you stand an excellent chance of finding the kind of person you are looking for. Paid members can contact other members using the built in messaging system or a dedicated Match.com email address. This provides you with complete privacy when first making contact with others. One of the most useful features offered by Match.com is the daily match feature, where you will receive a small number of suggestions for suitable matches on a daily basis. These are often worth looking into as they are usually very close matches based on the information you have provided. Other features include a range of games and quizzes that you can take part in, and have the results added to your profile. These are a bit of fun and also provide other members with a little more information about you. There are also a few extra paid features that you might like to consider using. These include a phone service, an email read notification service and a highlighted profile. The phone service enables you to talk to other members without having to reveal your phone number, while the email read notification service lets you know when someone has read a message you have sent them. The highlighted profile feature means that your profile will be displayed in a different color to help it stand out. As we have already stated earlier in the review, there is a free option at Match.com. You will need a subscription if you want to contact other members, or be contacted by them. A one month subscription costs $41.99, but you can save money if you pay for multiple months. A three month subscription works out at $26.99 a month and a six month subscription at $20.99 a month. The six month subscription comes with a guarantee that you if don’t find someone special in that six months you will get another six months for free. Please note that these prices are based on being in the US and prices will be different in other parts of the world. Match.com is more expensive than some other dating sites, but you can’t really argue against the value for money offered. They have a very large number of members, which obviously increases your chances of meeting someone compatible. The site is very easy to use and the search function is flexible and effective. As one of the biggest and best online dating sites around, they are definitely worth trying for a few months at least.